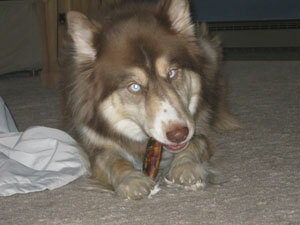 Sky is a three year old red and white Siberian that has looks and personality! This girl is currently in her home with a smaller dog that suffers from seizures and it will be best for both pups to be separated at this time. Her family loves her very much, but they know they need to make sure both dogs are not stressed. Sky is very affectionate and likes to give gentle kisses and go for long walks. She knows sit, come and shake. She is crate trained. She loves to cuddle and likes to play with toys. She is very friendly with strangers and people, walks well with other dogs and respects boundaries (fences and baby gates). True to her breed, if no one is looking and there is food on the counter… it will be Sky’s! Sky is the perfect age ~ past the puppy pranks and full of energy and love. If you are looking for a new best friend, please consider this wonderful Sibe!